The Optimum range of materials has long been established as the most wettable and comfortable RGP materials on the market. 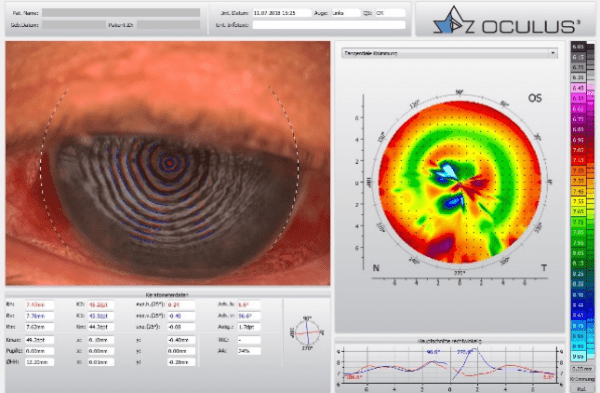 Recent years have seen remarkable growth in the usage of both ortho-k and scleral lens usage and, in response to this Contamac have developed Optimum Infinite, a hyper-Dk material which cuts like a regular material and wets without the need for plasma or surface coating. The material has a Dk of 200 yet, unlike other high Dk materials, does not flex, making it ideally suitable for both scleral and overnight wear ortho-k use. It is also useful for high oxygen demand corneae, such as in the case below kindly submitted by Michael Wyss of Eyeness AG, Switzerland. Chronic Sarcoidosis and Rheumatoid Arthritis, Glaucoma. RE AMD (no usable vision). Handling issues because of arthritis – extended wear RGP lens worn LE only. Hypoxia-related problems including corneal edema and endothelial blebs with current lens (Dk 125) reduced comfort and visual acuity. BCVA with Cl reduced to L 0.2. Edema and distortion reduced, visual acuity improved to 1.0, extended wear now resumed up to 1 week.